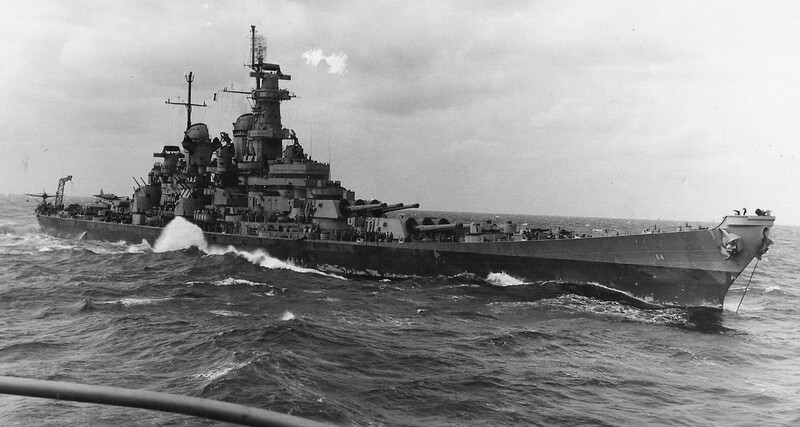 To conclude our look at the history of the units of the Iowa class, let's take a look at Wisconsin,1 the last American battleship built by hull number. 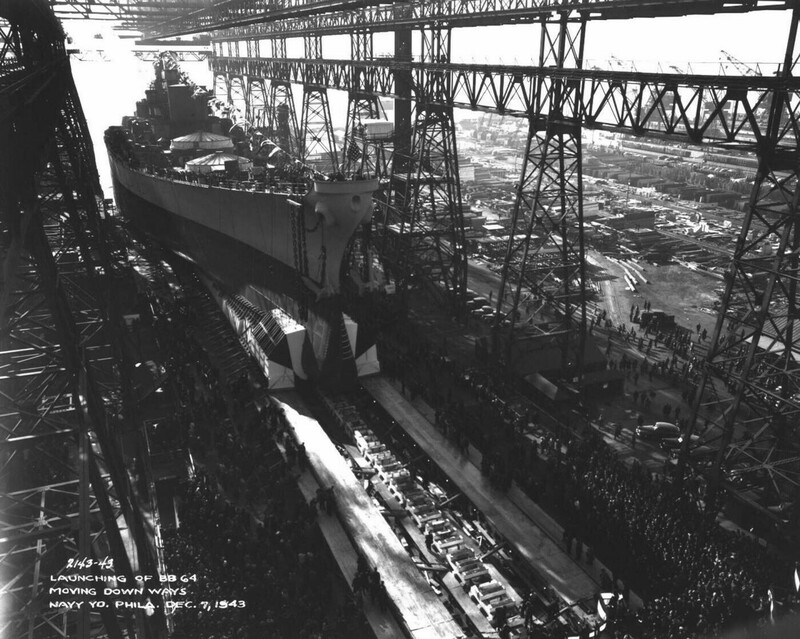 Wisconsin's keel, the last for a completed American battleship, was laid at Philadelphia Naval Shipyard, on January 25th, 1941, and she was launched on the second anniversary of the attack on Pearl Harbor. She commissioned only five months later, on April 16th, 1944,2 and after some training on the East Coast, departed for the Pacific, where she joined Halsey's 3rd Fleet in early December. 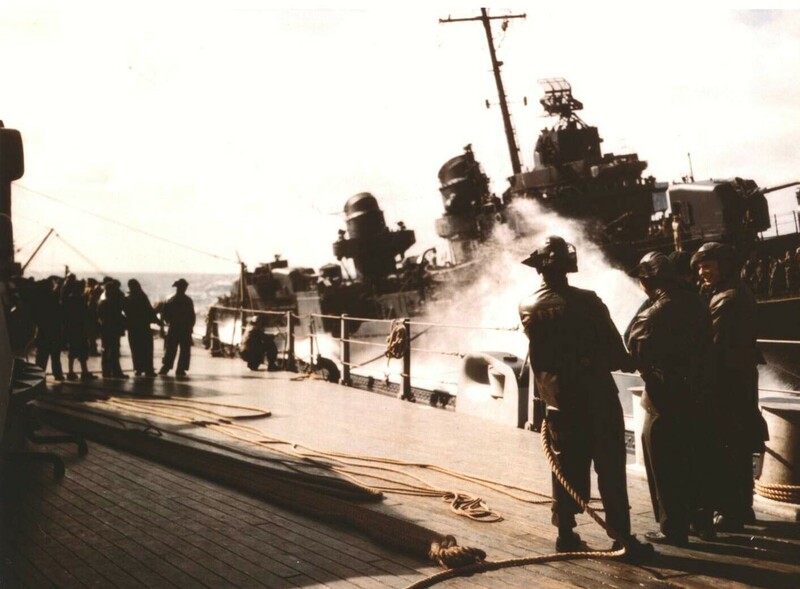 Only 9 days later, she found herself in the midst of Typhoon Cobra, which capsized three destroyers and damaged numerous other ships. Wisconsin supported the fast carriers of 3rd/5th Fleet through the rest of the war, screening the carriers from the growing Kamikaze threat. In January, she was ordered to bombard Cam Ranh Bay in Vietnam, but no targets were present and the order was rescinded. 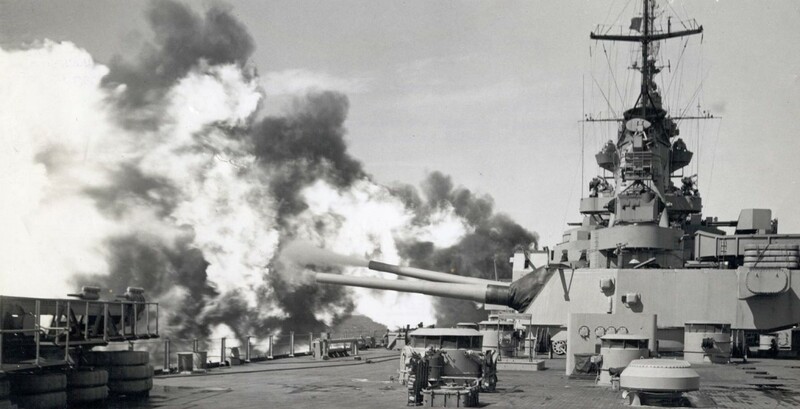 She then supported the invasion of Okinawa, spending 58 days continually at sea and steaming 25,000 miles, during which time she had the chance to fire 155 rounds of 16" against shore targets. She gave valuable service in air defense, firing so many rounds of 5"/38 that many of the sights for her 20mm and 40mm guns were knocked out (thanks to an 'entirely inadequate' allowance of spares), and directing fighters when the carriers were overloaded or suffering radar problems. In July, Wisconsin took part in the bombardment of the Japanese mainland. For reasons that are not entirely clear, she was not present in Tokyo Bay during the Japanese surrender. It's likely she was still on AA duty, protecting the carriers stationed nearby. During her eight months in the Pacific, she had steamed over 100,000 miles, shot down three Japanese planes, and refueled 250 destroyers. Immediately after the war, Wisconsin returned to the states, there to be a victim of the immediate post-war drawdown. In mid-1946, her crew reached a nadir of 600, less than a quarter of its wartime level and far too few to safely take her to sea. When enough men were finally reassigned to her, she was primarily employed in training cruises, although these were sometimes comical. Once, 18 mailmen were assigned for training on a two-week cruise during which the ship received no mail. Late in 1946, she did get a chance to show the flag in South America, carrying Admiral William Leahy to the inauguration of the new President of Chile. However, her days were numbered, and she was decommissioned on July 1st, 1948, at Norfolk. As with her sisters, this rest didn't last long. Wisconsin was the second ship to be reactivated when the Korean War broke out, and followed Missouri and New Jersey onto the gunline. She recommissioned on March 3rd, 1951, and had enough time for a pair of midshipman training cruises before she was dispatched to Korea, where she entered action on December 3rd. Her four months on the gunline were much like those of her sisters, doing everything from providing fire support for the troops on the front lines to hitting transportation and industrial targets deep inside North Korea to setting coal piles alight with 5" white phosphorus rounds. One prisoner even reported that his battalion's political officer attributed the craters Wisconsin's guns left to atomic artillery. But in April, it was time to pass the baton over to Iowa and return home for another round of training cruises up and down the East Coast and across the Atlantic. She returned to the Far East in October 1953, shortly after the end of hostilities in Korea, and served as flagship of the 7th Fleet for six months before she returned to the East Coast. Once back to Norfolk, Wisconsin turned again to the standard peacetime duties of the Iowas, training midshipmen and showing the flag abroad. 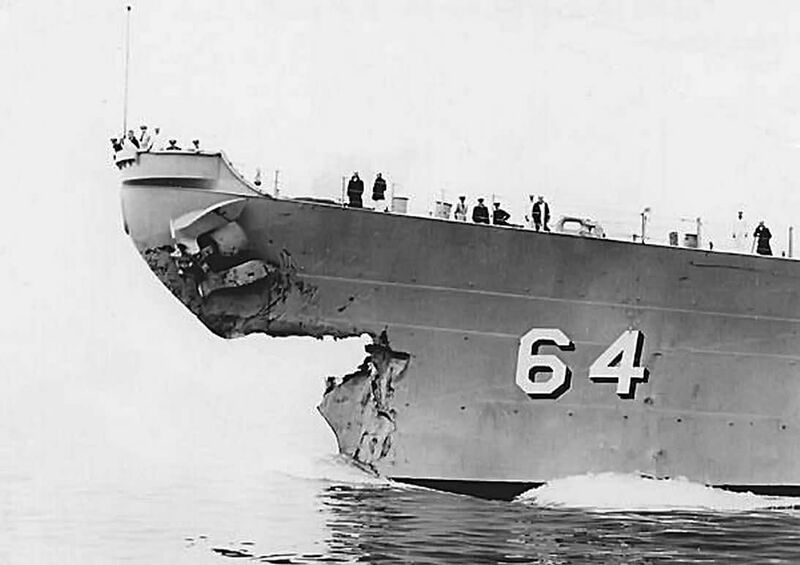 The only real excitement came on May 6th, 1956, when, in a heavy fog, Wisconsin rammed the destroyer Eaton.3 The battleship's bow was mangled, and the destroyer, though badly damaged, survived and was ultimately returned to service. Astonishingly, there were no deaths and only one serious injury as a result. To speed Wisconsin's repair, a 68 foot, 120-ton section of the bow of her unfinished sister Kentucky, was removed and barged to the drydock where Wisconsin lay. In a heroic feat of naval engineering, it was attached in 16 days, allowing Wisconsin to return to sea by the end of June and make her scheduled midshipman training cruise that summer. To this day, the ship is sometimes known as Wisctucky as a result. 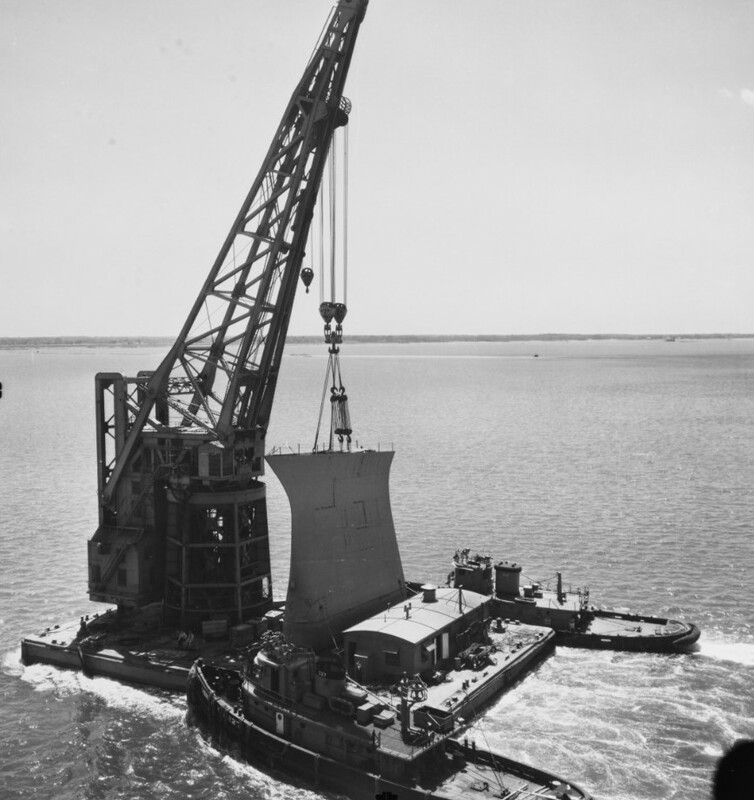 But all good things must come to an end, and on March 8th, 1958, Wisconsin was decommissioned at Bayonne, New Jersey. All three of her sisters had preceded her into reserve, and, for the first time since 1895, the United States did not have a single battleship in commission. 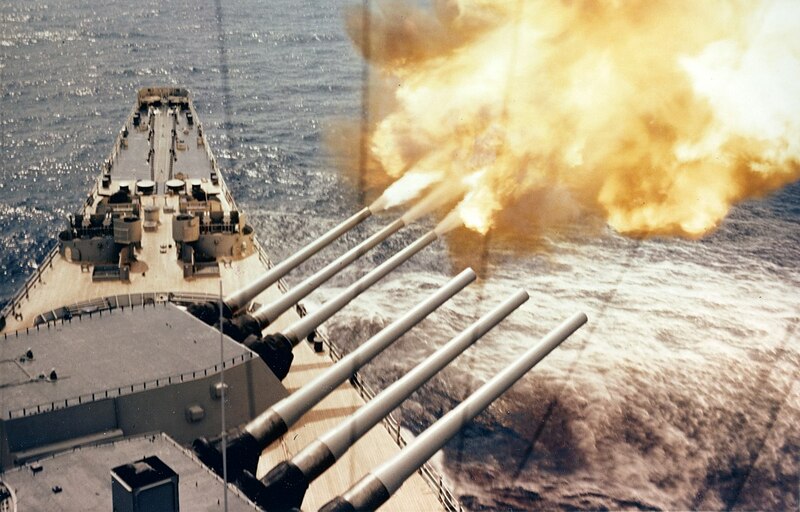 When President Reagan announced his intent to reactivate the battleships, Wisconsin was the last one chosen for the process, possibly due to a fire she suffered while in reserve. Reactivation work began in 1986, when she was towed to Avondale and Ingalls shipyards, the same yards that had put Iowa back in service. She recommissioned on October 22nd, 1988, and joined Iowa in the Atlantic Fleet. But even while she was working up, tragedy struck her sister and the Soviet Union began to collapse. It was clear that the days of the battleship were numbered. 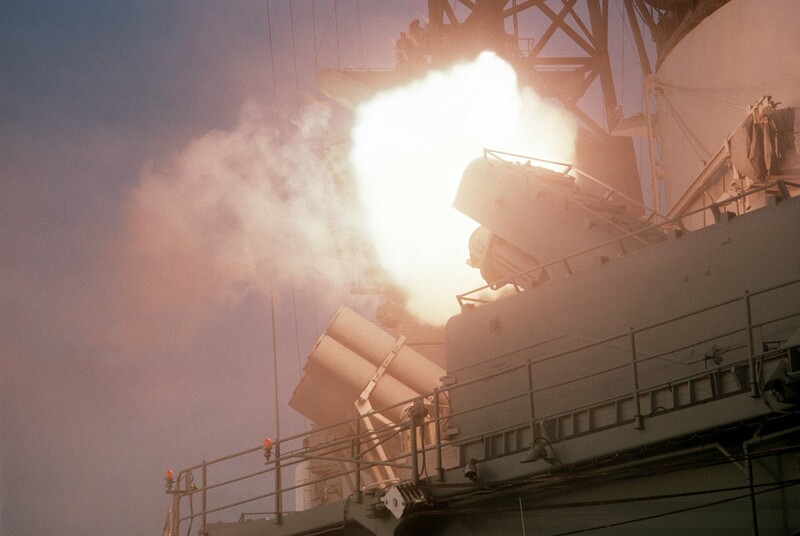 On February 6th, she relieved Missouri on the gunline off Kuwait, and got the opportunity to fire her guns at an enemy for the first time in almost 40 years. 11 rounds quickly destroyed an Iraqi artillery battery, followed by 308 more over the next month. She spent the rest of the month working with Missouri, bombarding targets near the coast and doing their best to make the Iraqis think an amphibious invasion was imminent. 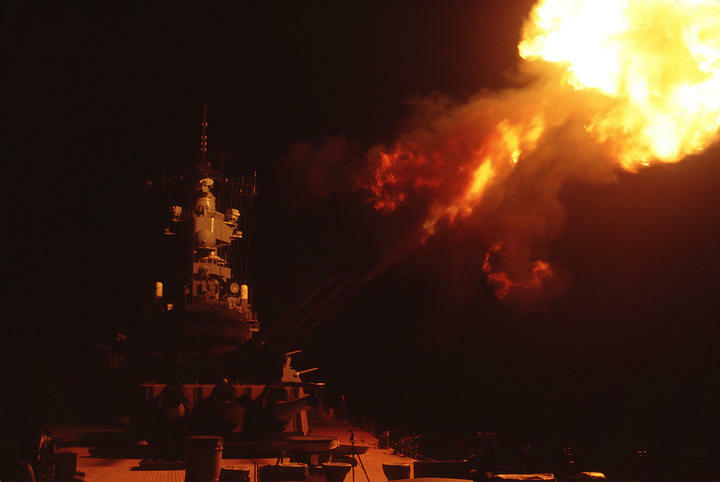 One notable moment was on March 1st, when a group of Iraqi soldiers surrendered to Wisconsin’s Pioneer UAV, the first time anyone had ever tried to surrender to an unmanned aircraft.5 On February 28th, just before the cease-fire, she fired the last gunfire support mission of the war, which ultimately became the last salvo ever fired by a battleship in anger. 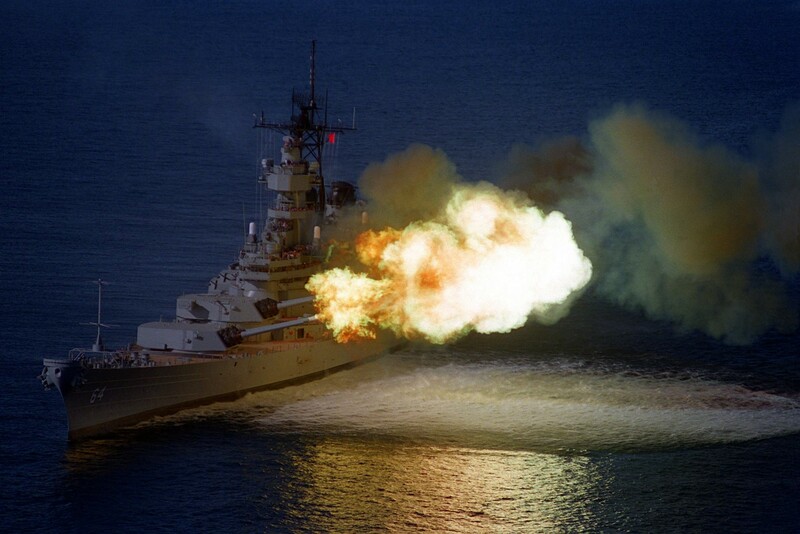 Exactly four months later, Wisconsin fired the last salvo ever to come from the guns of a battleship. Four months after that, on September 30th, 1991, she was decommissioned. Missouri would linger a few more months. Wisconsin spent the next decade and a half in the reserve fleet. Like Iowa, she was restored to the Naval Vessel Register in 1996 by Congress, which was concerned about the future of naval gunfire support.6 In 2001, however, she was towed to Norfolk and her decks were opened to the public by the Hampton Roads Naval Museum. In 2006, she was stricken from the Naval Vessel Register, and the City of Norfolk took control of the ship in 2009. 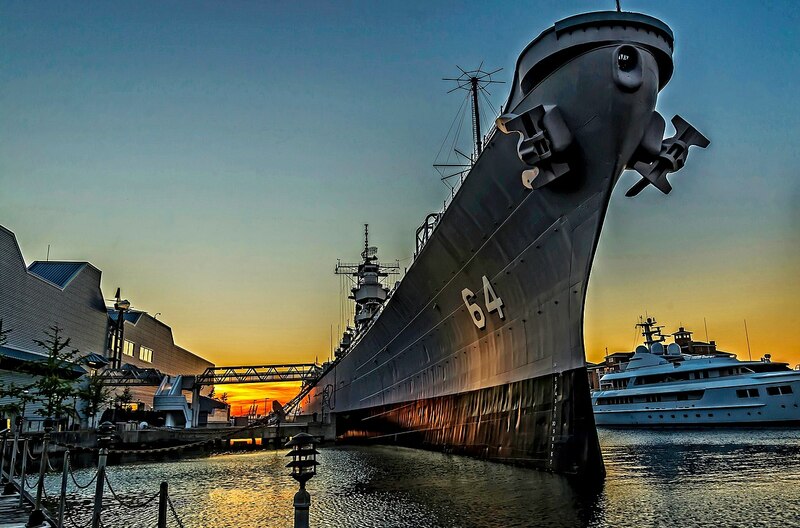 Today, she is open to the public as part of Nauticus, a major maritime museum in Norfolk, VA. In mid-1946, her crew reached a nadir of 600, less than a quarter of its wartime level and far too few to safely take her to sea. How many men would be required to take an Iowa safely to sea, presuming nobody is actively trying to sink her? The 2400+ wartime crew would have been about half AA gunners and the like, spending their days pretending that extra deck-swabbing was a vital nautical task. The Sacramento class AOEs had roughly half an Iowa's engineering plant and a nominal 600-man crew, but at least some of those would have been specialists for UNREP and other mission-specific tasks and there would presumably be economies of scale in some of the engineering and shiphandling task. So, less than 1200 and probably significantly less. It depends on exactly what you want (how fast are we going to need to go, and how long do we need to stay at sea), but I'd say that it could go as low as 300 if you just needed to do a short transit at low speed. Part of the problem with the 600-man compliment was that a lot of them weren't critical to the ship's operation, so Wisconsin even more shorthanded in the critical billets.